Disclaimer: The blogs on this site are written by our volunteers and guest writers. They do not reflect the views of the WCIA. We hope that sharing a range of views will encourage discussion and debate. Please get in touch if you wish to contribute a blog. Blogs are published in the language the volunteer has chosen to write in (whether that is Welsh or English) and we welcome submissions in both languages. What we stand for is what we stand on, read their signs. 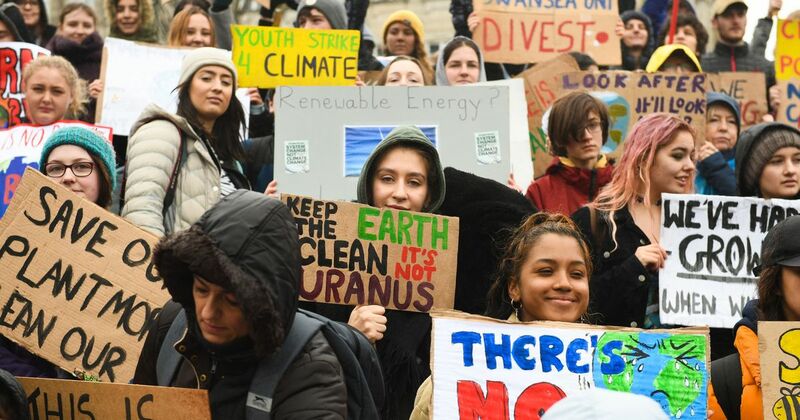 When 300 000 German students, 10 000 Londoners, 150 000 Montrealians or thousands in Chile, Colombia, Croatia and South Africa marched down their streets on 15th March to protest against the inaction of their governments regarding the current climate crisis, it was clear they were standing up. “The climate strike is a wake-up call to our own generation. And it is the start of a network that will solve the greatest challenge in human history,” reads the Climate Strike Facebook page. And that is the goal of the movement, inspired by the 16 year old Swedish activist Greta Thunberg, who first skipped school in August 2018 to strike in front of the Swedish Parliament building. Yesterday she was a student skipping school every Friday, today she is nominated for the Nobel Peace Prize. Thunberg is the face of this new Green Revolution we are witnessing today. This Earth Strike, as the 15th March protest was called, already took place on 15th February when, for instance, more than 10 000 students across the UK went on strike. Hoping another action a month later would make the movement grow and reach out even more globally, they decided to repeat the experience on 15 March. And it worked. In Wales, for instance, only Cardiff went on strike in February. In the March protest, other cities decided to follow its lead such as Aberystwyth and Swansea. A third march is planned on 12th April. If you want to make a difference, find out more about the event on facebook here and make sure to bring your sign and march down your streets this friday!